Mike LeChevon, left, and Bruce LeGoat pack clubs up a hill on the first hole of the Gauntlet Course at Silvies Valley Ranch. "It's a great day to be a caddy," I said to my best buddy and Caddy Master Bruce LeGoat as we walked up the gentle grade from the livery stable to the caddy shack at Silvies Valley Ranch to eat our breakfast of organic antelope brush and juniper, and sip on spring water, like the kings of the course that we are. "You boys have a round at 10 this morning, so eat up and we'll get you fitted with your backpacks for the day," the caddy assistant said. "Hey Mike," Bruce asked me, "Do you think these guys know how to play, or do you think we'll be looking for lost balls all day?" I didn't bother to answer. I was way too busy munching on the delicious breakfast in my trough. Right at 10, two guys in shorts came to the first tee, trying to lead us around like we were regular pack animals. My player—some sort of writer—even tried to grab a club without asking me the yardage first. I gave him a polite snort and offered the 9-iron, which he proceeded to hit into the green-side bunker. On the second hole—fortunately, there are only 7—my player hit a sizzling hosel-rocket into the sage. Mike gave me his famous "oooooh greaaaat" as we both snickered and sniffed around for his Titleist. After putting out, and again trying to grab a club without my council, I decided to lean into my player with my head to get his attention. Apparently he's spent some time on the farm because he leaned back, then quickly moved his weight away. I nearly took a knee. He shot me a glance, and then some scratches under the chin and a peanut. I knew we'd be best buddies. Bruce and I lugged the two players' clubs up the rises and down the hills. Neither player lost a ball after the second hole and were kind enough to let us drink from the water bucket on the fourth hole, where there's also free beer for the players. Walking down the nice path to the final green, I leaned into my player, who gave me lots of pets and scratches under the chin. He didn't really need the lead; we were best buddies and I hoped to see him again soon. After the assistant took off my pack—equipped with three can holders, two tubes for clubs and pouches for peanuts and golf balls— and refilled our water, Bruce and I chatted about the round, and how much better life was since we became caddies. "I'm so glad to be out of that dead-end job," Bruce said, looking over the ranch, watching our 2,000 or so friends and family work the fields. I thought about all the friends I'd lost to the daily grind. "You're dead right Bruce," I said, taking a long sip of the water and grabbing another mouthful of sweet grass. 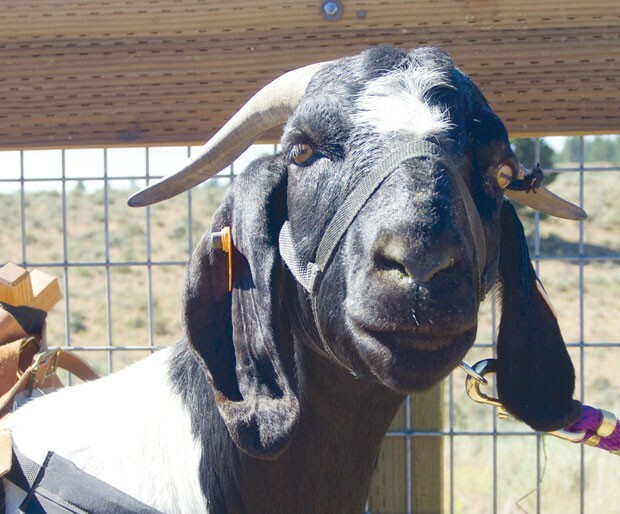 Silvies Valley Ranch in Seneca, Ore.—a three-hour drive east of Bend—has one of the largest herds of organic meat goats in the world. This spring, the team started the goat caddy program, used on the 7-hole McVeigh Gauntlet course, "when the goats were asking for different career opportunities—for good reason," Colby Marshall, vice president of livestock and guest services, said. The ranch currently has two goat caddies and two more in training. Bruce LeGoat is the caddy master and has three years of training under his belt. Mike LeChevon—who caddied for me and is an exceptionally friendly goat—is four years old and a fine caddy. 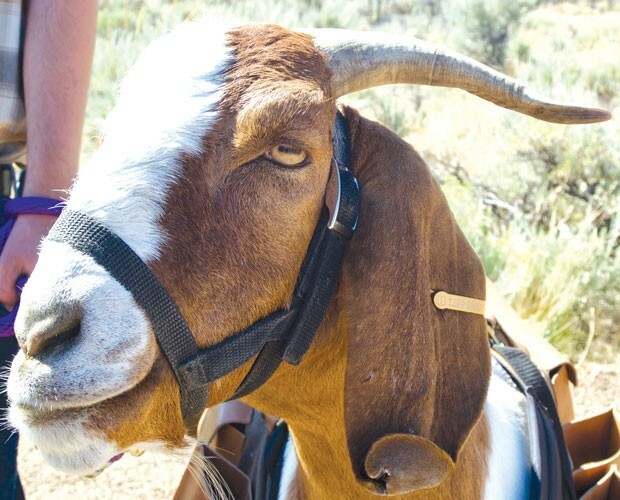 Peanut LeGoat is two, the nephew of Bruce, and loves his new career (he was the Reserve Champion Market Goat at the Harney County Fair in his previous profession). Roundabout LaDoe is a year and a half and will be the first female goat caddie (Silvies thinks) in the world. The ranch has another 18-hole course, which is reversible, making it two different courses. There's also a 9-hole, par 3-course, among the other sporting opportunities, like shooting ranges. If you want to have fun, and have an animal companion, the Gauntlet course is well worth the quick round. The course is hilly, but the views of the Silvies River Valley are without compare. It's not an easy course; the greens are small and the two par-4s require some precise shots or you'll lose a few balls, but hey, you have a goat carrying your clubs, so lighten up! Since the goat caddy course is so new, the greens and tee boxes will need some time to mature. Pro tip: bring a ball mark repair tool and replace your divots whenever possible to let the grass mature.